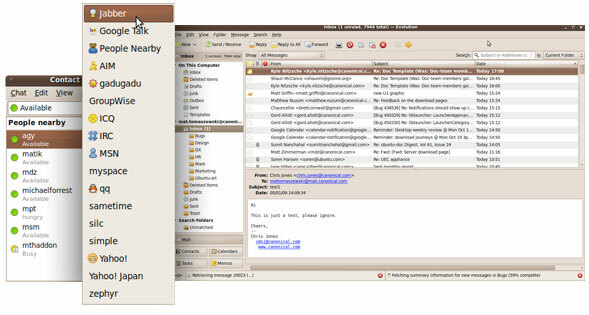 Chat to friends and colleagues through Empathy which integrates: Yahoo, Gmail, MSN, Jabber, AOL, QQ and many more. For a choice of other open-source web browsers visit the Software Centre and take your pick. Plug in your PSP, iPod, MP3 player and use Rythmbox to download, store, buy and play music. Access Last.fm directly through Rythmbox to stream your favourite music. 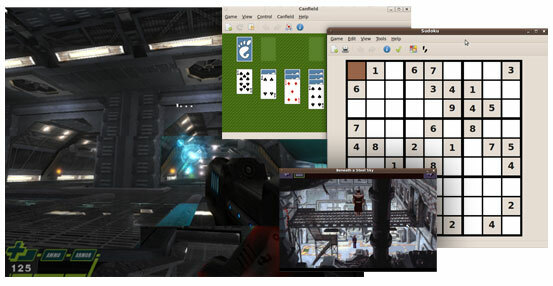 Visit the Software Centre to easily browse, select and install games. Integrated “Ubuntu One” technology gives you 2 GB of online storage for free. Easily share files between your own and your friends’ computers. Categories include: Education, Games, Sound and Video, Graphics, Programming and Office. At the core of the Ubuntu philosophy is the belief that computing is for everyone and whatever your circumstances. Ubuntu is one of the most accessible operating systems around and is fully translated into 23 languages with many more to follow. Yeah I guess Rythmbox is still what I’ll use for media. I used Amarok until Amarok 2 came out, and I just plain can’t figure out how to use that one. I have been using Ubuntu since 8.10 version. I am not so happy with Jaunty, but I hope Karmic can work well with my intel graphic card, and yahoo video call can be supported without having to install Gyachi..
and a Samba that can act as domain server for Windows 7. I am psyched, this is gonna be great. To bad they couldn’t integrate wine like they planned.